Richmond Mayor Dwight C. Jones joined Reynolds President Dr. Gary Rhodes on Thursday, August 13, 2015 to dedicate a "GoBike!" artistic bike rack at Reynolds Downtown Campus as part of a larger initiative ahead of the 2015 UCI Road World Championships in Richmond, Virginia. 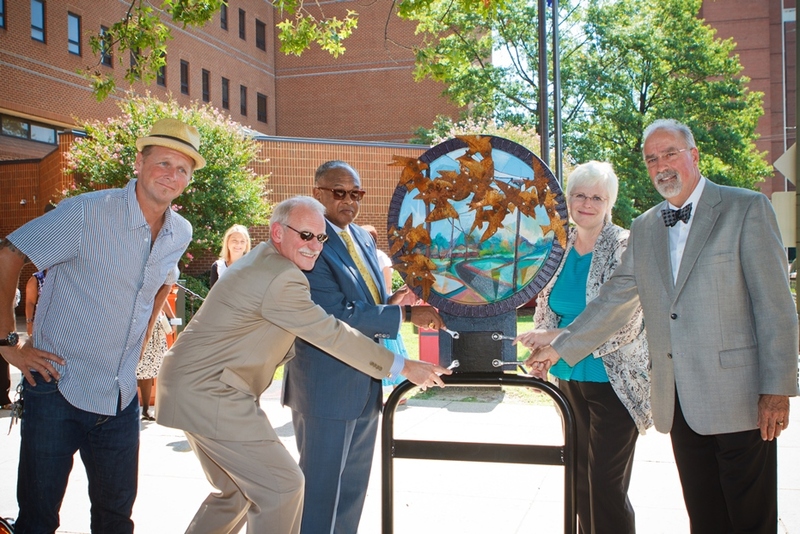 The bike rack art, titled "In search of our hopes and dreams, a long road traveled," was created by award-winning artist Ed Trask. “Reynolds is thrilled to support local creative talent in the City of Richmond. Ed Trask’s piece is an inspiring reminder of each individual’s capacity to learn, grow and choose their own destiny. Reynolds is proud to be an institution where thousands of outstanding lives get started every year in the greater Richmond region,” said Reynolds President Dr. Gary Rhodes. To read more about the "GoBike!" initiative in a recent Richmond Times-Dispatch story click here. August 24 marks the first day of classes at Reynolds Community College. First year students, we welcome you to Reynolds and returning students, welcome back! The Office of Student Life is starting things off by hosting Welcome Back events on all three campuses on August 25, 26 and 27 featuring food, giveaways, music, and games. On a more serious note, renovations on the Parham Road Campus continue and some services have been temporarily relocated while construction takes place. For the most up-to-date construction information, visit the construction webpage. In the middle of the food court at Regency Square Mall, a group is making a powerful statement without saying one word out loud. “Well, what it does is allow people to know that deaf people are people and that we like to get together like anybody else,” Danny White signs. White and Reynolds Associate Professor & ASL&IE Coordinator Bruce Sofinski are both taking part in what is known as a silent lunch. The deaf and hearing communities combine in this setting and communicate with American Sign Language, laughter and smiles. “Deaf people can do it, can do anything. We are the same as people who can hear just that we can’t hear,” signs Sylvia Crespo, a mother of three boys who has lived in this area for three years. Silent lunch participants sign about their jobs, families and everything else going on in their lives. About 12,000 people in the Richmond region are deaf or hard of hearing. The population is composed of men, women and children of all races and ages. Graduates of the Reynolds Community College Practical Nursing Certificate program recently participated in their recognition ceremony on Wednesday, August 5 in the Lipman Auditorium on the Parham Road Campus. The ceremony opened with a welcome by Reynolds practical nursing program head Wendy Falls followed by encouraging words from student Tyquan Churchwell and keynote speaker adjunct instructor Christina Jennings. The Practical Nursing Certificate is designed to prepare a person to be an integral member of a nursing or health care team. A practical nurse's duties include direct care for individual patients experiencing common, well-defined health problems with predictable outcomes in a structured health care setting with supervision. They are usually the first medical professional to work with a patient with targeted care to include giving medication as prescribed by a physician, taking vital signs, such as blood pressure, temperature, weight and basic wound care including cleaning and bandaging injured areas. With completion of the program, these student are eligible to take the national examination for licensure as a Practical Nurse (LPN).